This is just a quick post on controlling DC brushless motors with no encoders. This post applies to brushless motors that typically use hall sensors for commutation. 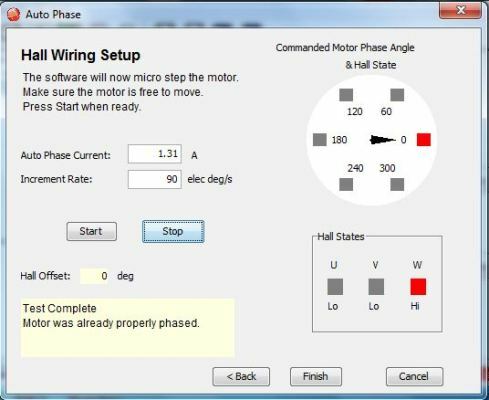 This post does not apply to the hall-less ESC (electronic speed control) motors that typically run at very high speeds and are used for things such as quadcopters and boats. The motor can spin a little and figure out how to commutate without waiting for the 3 hall effect sensors to change. This improves the starting of motion. The controller can know the precise position so that it can servo on a position and not jerk/move as it tries to hold a position. You can now do position control. The commutation and torque/speed profiles are more efficient since the controller has position feedback and can do sinusoidal commutation instead of the more basic trapezoidal commutation. Only operate at high speeds so that the hall sensors are sufficient for speed control (you might still have a high variability in your speed based on applied load). You will need to tune the PID (or PI or PD) filter more than normally. The PID constants will often need to be much higher (I have seen 1000 times higher) to compensate for disturbances in the motor. You will probably also need the higher gains to help the motor start to spin. This is a bit of a hack but on most hall sensors (assuming it can source enough current) you can tie two of the halls to the quadrature encoder inputs on the motor controller to get a rough uneven position control. That can also respond to changing loads. Instead of issuing a “servo here” command to hold a position, you will probably need to disable motion (cut off power to motor). If you are in an application where backdriving a motor is fine or where your gearing provides sufficient holding torque this could be ok. When you are purchasing your motor controller you should check if it can support hall based feedback only. Some controllers do better than others at handling the lack of encoder feedback.